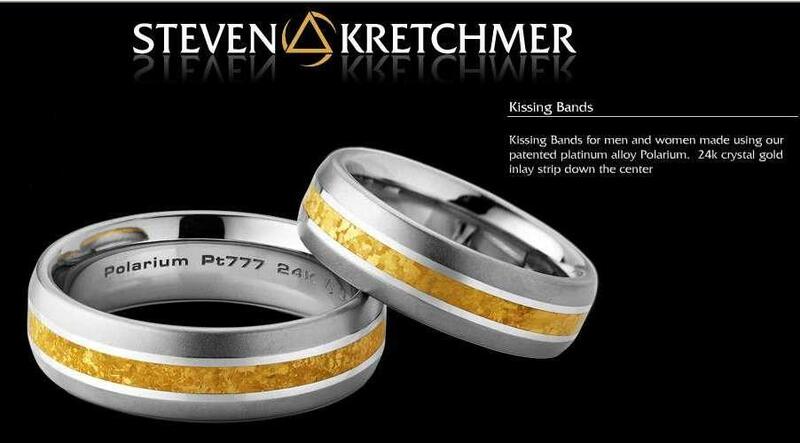 Kissing Bands for men and women made using our patented platinum alloy Polarium. 24K crystal gold inlay strip down the center. Metal finish choice, engraving options, ring size, band shape, font for engraving, and engraving instructions may be selected in "drop down" box at "Add to Cart" area. Variations of this style are available starting at $3,140. Polarium® is a revolutionary, permanently magnetized platinum alloy developed by Steven Kretchmer for a line of jewelry that exhibits amazing behaviors, including levitation! It is 77.7% pure platinum, extremely hard, and resists scratching far better than any other precious metal jewelry alloy available anywhere but TQ Diamonds! Steven Kretchmer's Polarium® brings a new dimension to fine jewelry that has never been experienced before! In Chinese, the "magnet" means "love stone". Like the force of love, Polarium® possesses the mystical power of attraction, the ability to draw isolated bodies together. Related to all powerful forms of energy, Polarium's attraction is contagious. There is something very elemental and calming about playing with Polarium®, and once you begin to experience its attractive force, you can't help but enjoy it! Any one-piece Polarium ring can be magnetized with a Single Field, while rings made of more than on component can be configured with either Single Field or Multi-Fields. 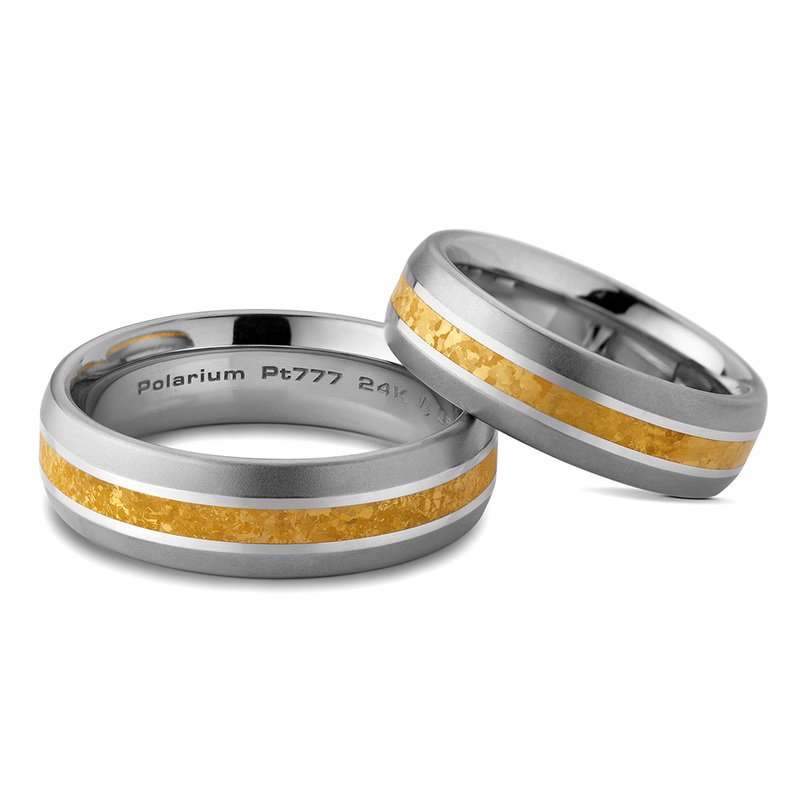 Single-field Polarium® has a broad range of attraction, and will be playfully drawn to most metal objects and other Single-field Polarium® jewelry. Multi-field Polarium® maintains an exclusive attraction designed to confine magnetic force within the piece itself. Multi-field Polarium® jewelry is attracted only to its own components and will not be drawn to other metal objects, or effect watches and credit cards! Polarium® will not affect pacemakers, computers, or cell phones. Single Field Polarium® should be worn on the same hand as fine mechanical watches to avoid direct contact between the two. Due to its extraordinary properties, all Polarium® jewelry must be serviced only at and by Steven Kretchmer's studios - see TQ Diamonds for assistance! The best way to remove particles that might accumulate on Polarium® jewelry is to roll a piece of tape, using it to dab unwanted debris away.